A plays to B who turns and plays to C. B continues on a looping run around C. C plays back to A who followed his pass. A plays diagonal to player B making a looping run. A should end up at C and C winds up A. 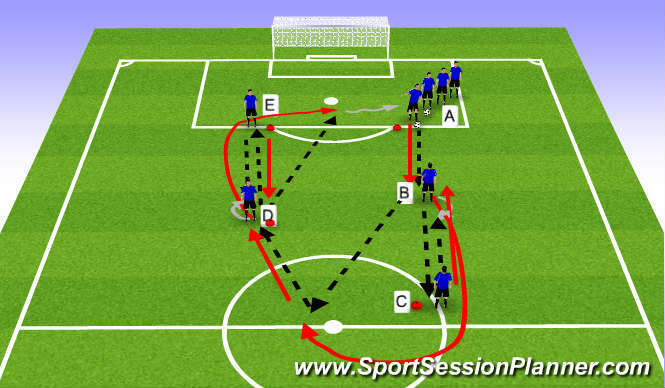 B nows plays to D who turns to play E. D continues on a looping run around E. E plays back to B who then plays diagonally to D. Player B winds up at E and E winds up at D.
Players must try to play to bothwide players before scoring a goal. 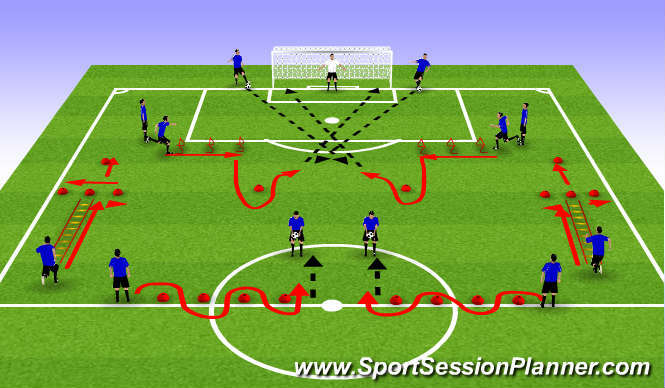 Encourage the wide players to move up and down the line to offer good angles of support. Players should be encouraged to get wide players involved in the flow of the game and not be a static situation.